Thirty-five years ago, in 1984, Mick Patrick and Ady Croasdell compiled the first volume of Where The Girls Are, which was released on vinyl. This was just before the emergence of the CD, which within a few years, replaced vinyl in many people’s music collection and affections. By the nineties vinyl was a favourite find in charity shops up and down Britain, and shrewd collectors hoovered up rarities aplenty as record companies continued to release their back catalogue on compact disc. This included Ace Records, who in 1997 released the first volume of Where The Girls Are on compact disc. It was compiled by Mick Patrick and Malcolm Baumgart. For the two compilers,they had no idea just how successful the Where The Girls Are series would become. Twenty-two years later, and Where The Girls Are Volume 10 brings the curtain down on one of Ace Records’ most successful and critically acclaimed series. However, Where The Girls Are Volume 10 is bowing out at the top, with twenty-six tracks old and new. This includes contributions from The Bronzettes, Kelly Garrett, Naomi Wilson, The Teardrops, The Avons, Jackie and Gayle, Maureen Gray, Diana King, The Sweet Things, Tari Stevens and The Darlenes. They’re just a few of the names on Where The Girls Are Volume 10, which brings the curtain down on one of Ace Records’ most popular and best-loved series. 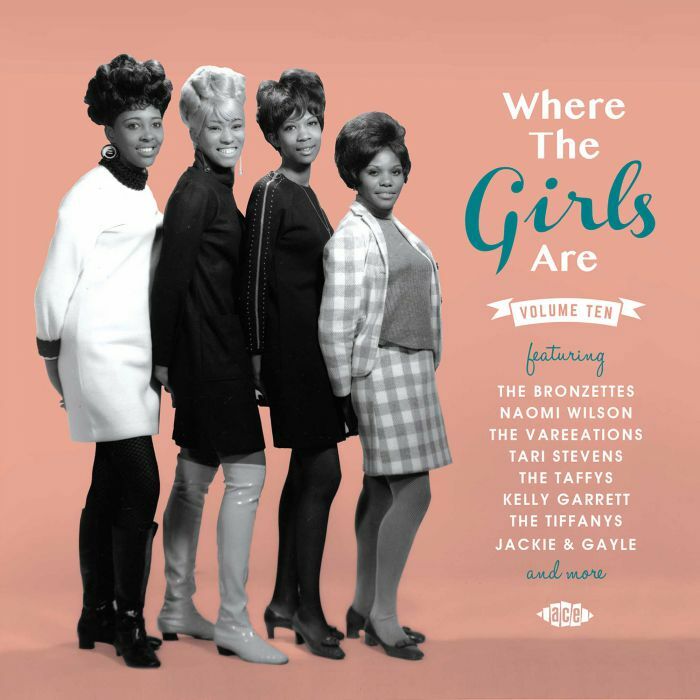 Where The Girls Are Volume 10 spans the years between 1962 to 1968, and includes tracks recorded in Philadelphia, New York, Los Angeles, Nashville and Cincinnati. Many if these are making their first debut on compact disc. This includes the previously unissued track Top Twenty by the Delicates. Among the familiar faces are The Shirelles’ Two Stupid Feet, He’s My Hero by The Avons and That Guy Of Mine by The Sherry’s. This is just a small part of the story of Where The Girls Are Volume 10. However, there’s highlights aplenty on compilation that marks the end of an era. When it comes to highlights there are many, including the dancefloor friendly track Hot Spot by Philly girl group the Bronzettes, which opens the compilation and was produced by Chubby Checker. Then there’s Nothing Can Go Wrong from LA based group The Bea’s who contribute a jangling hidden gem that sounds as if it was recorded in the last thirty years. Another welcome addition is the Phil Spector inspired Big House which comes courtesy The Carolines, from New York. This however, is just one of many quality cuts chosen by Mick Patrick. Welcome additions from girl groups include The Teardrops’ . I Will Love You Dear Forever, The Vareeations’ It’s the Loving Season, The Sweet Three’s I Would If I Could, The Tiffanys’ Happiest Girl in the World and The Darlenes’ (I’m Afraid) You’ll Hurt Me. These tracks ooze quality and so do the contributions from the solo artists. There’s a number of solo artists on Where The Girls Are Volume 10. This includes Kelly Garrett’s This Heart Is Haunted, Just a Little Touch of Your Love by Saundra Franklin, Maureen Gray’s Summertime Is Near, Diana King’s That Kind of Love and Donna Loren’s Johnny’s Got Somethin’ which closes Where The Girls Are Volume 10 and this long-running and critically acclaimed series. While Where The Girls Are Volume 10 marks the end of an era for Ace Records, at least it’s a case of ending on a high. Best to bring the compilation series to a close on a high, rather than following in the footsteps of other franchises who eventually lost their mojo, and after a couple of indifferent additions belatedly called time. At least, music fans will always remember Where The Girls Are as one of the finest girl group compilation series. Where The Girls Are Volume 10 is a welcome addition to the series, and showcases an array of talented groups and solo artists. Some of them will be familiar names, while others are will be new to most people. They all have one thing in common…quality. The final instalment in this long-running and much-loved series ends on a high with Where The Girls Are Volume 10, thanks to lone compiler Mick Patrick who puts a lifetime of knowledge to good use. For that, music fans should be grateful. ← CANNED HEAT’S LIBERTY RECORDS’ YEARS.